I am the type of person who will simply say that I like this and that and add that I have no particular reason for liking the said thing. Okay, to get closer to the truth, I will admit that sometimes it is a problem of not getting the exact words to use to express certain connections I have to certain things. So, I have no specific words to explain this pull that posseses me when I enter the Library and pushes me to the Fiction section. The problem with the Fiction section in this Library is that it does not guide me properly to a specific spot I know I want to stick to. It takes me to American Fiction, Russian Fiction, German Fiction, everything else but African Fiction. So, I have to loiter around the English and Irish fiction section to find African books. Since I finally manage to locate the said African books, both the classics and the contemporary, I should not complain further. This Library is the starting point for my participation in the African Reading Challenge 2012 hosted at KinnaReads and into which I was lured by Charlyn via APWIC. The Reading challenge has several rules, all of which one can break according to priorities and convenience, as long as the focus remains reading African Literature. So, I am bending the rules as far as I can to suit my immediate reading needs. The challenge is happening between January to December 2012 and includes all parts of Africa (one should cover a minimum of two), even the island nations and the minimum number of books to read is five. One can do Fiction or Non-fiction (atleast one Fiction book though), mix contemporary and classic writing, include translated fiction from Arabic, Francophone and Lusophone, mix male and female voices among other guidelines. Because the above guidelines are flexible, I am stretching them a bit, in the process totally disregarding some. Kinna Reads however has already divided us readers into two categories, the novices and the advanced. For the novices, the advice is that they mix atleast two regions, two languages, classic and contemporary with both male and female writers. The novice does not have enough freedom to 'like' and follow the impulse of whim as the Advanced reader. The advanced reader can choose to read books centering on country, region, language, theme, gender or author to fill some gap and explore some specific works further. 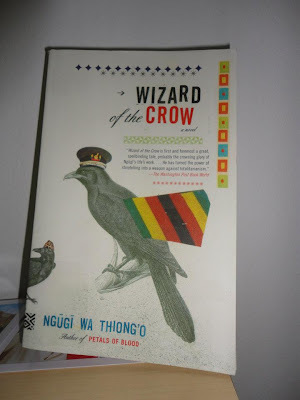 Because the thread that ties all this together is having fun and exploring Africa through books, I am handing myself over to urge as I partake the challenge. I have cheated by looking through other people's lists, some saying they do not want to read books that remind them of secondary school literature and other interesting rationales for the selections made. Well, I have decided to do one thing; select the books following the urge that takes me to the Fiction section of the Library. I will read pre-2000 books (except one), written by a 'specific' generation of African writers (post-colonial or whatever you like) and will do only novels and plays. That is for the first half of the Challenge. My first half is three months, from now until May/June. I will do five books in this half. After May/June, I will pick more five for the remaining half of the year. I am being both a novice and an advanced reader in this first half. I am doing only three regions of Africa and regrettably reading only male writers. In the next half, I am thinking about anthologies of short stories, contemporary writing, and more female voices, will see where whim and urge take me then, may even do translations. 1. Ngugi wa Thing'o, Wizard of the Crow (East Africa - 2006 - Novel) I am hoping that this will take me through the long journey of Ngugi wa Thing'o's writing, as touted by reviewers. 2. J.M. Coetzee, Disgrace (South Africa - 1999 - Novel) I am already in bed with Soraya, I do not know what took me this long to enter this apartment. 3. John Ruganda, The Burdens (East Africa - 1976 - Play) The best of Ugandan-written drama, in my 'humblest' of views. 4. Elechi Amadi, The Great Ponds (West Africa - 1969 - Novel) I am hoping that this one will cure the obsession-like feelings triggered by The Concubine. 5. Wole Soyinka, The Lion and the Jewel (West Africa - 1962 - Play) Africa's first Nobel Prize for Literature Laureate, trying to get back to where he started from. I forgot to say that I will be posting here some 'feelings' that accrue from these books (call them reviews if you like). And also to report that I am such a bad person I have already cheated by reading atleast the first pages of each one of these books!